The most important thing to understand about King size beds is that there is a significant difference in size between the UK, Ireland and South America and North America, Australia and New Zealand when referring to King size beds. The UK & Ireland King size beds are a similar size to Queen size in the US, Australia and New Zealand. US, Canadian, Australian and New Zealand King size beds are similar in size to beds referred to as Super King size in the UK, Ireland and South America. What Size Is A King Size Bed In ...? The North American king size is also sometimes known as the Eastern King the the United States as there is a variant King size bed known as the California King 6' x 7' (1.83m x 2.13m). Other names that are occasionally used for the California King are Western King, West Coast King, Cal King or, quite humourously, the WC King. European 180cm (5'11") width beds are equivalent to the King size beds in South America. 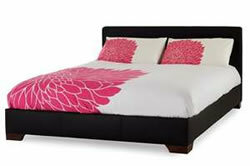 200cm width beds are closer to the North American, Australian and New Zealand King size beds. In Southern Europe 190cm and 180cm length beds are just as common as the 200cm standard. The British and Irish King size bed is the equivalent of the Queen size available in North America, Australia and New Zealand. An extra length king size bed is generally available in South Africa with measurement of 183cm x 200cm (1.83m x 2.00m or 6' x 6'7").